I'm certainly not an avid book reader (just look at the sidebar and notice that Feast for Crows may never actually get crossed out) but when it comes to auto-biographies, I can fly through them. Especially when they just so happened to be written by one of my favorite wrestling personalities of all time: Chris Jericho. I had read Jericho's previous books (A Lion's Tale and Undisputed) in about two weeks total, so I was expecting to fly through this rather quickly. And I did. 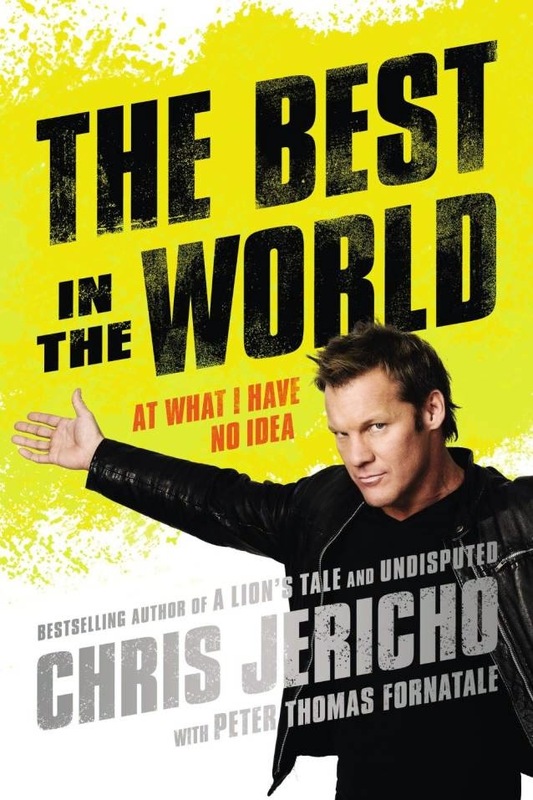 I read all of 'Best in the World' in about three long reading sessions and enjoyed almost all of it. I think that the biggest problem with the book is that Jericho seems to think we don't want to hear about what he already went over in the last books: the wrestling. Sure, there's plenty of wrestling stories in the 226 page duration but they often just get glossed over. He spends more time talking about meeting Metallica backstage than his exit from the company in 2010 (something I was quite interested in since I attended the Raw that ended up being his last match in that run). I'll never tire of hearing stories about Vince McMahon and Jericho has those in spades. From the time that Kofi Kingston fought McMahon on the private jet, to hearing how upset Vince gets when someone bleeds on Television, it's all wonderfully fun and opens up a different view of who has otherwise been presented as a scary authority figure. Don't worry though, he's still that. And Jericho clearly is both gun shy and respectful of him. It's an interesting dynamic that provides endless entertainment throughout the book, particularly Vince's text messages. Being a CM Punk fan, it was particularly enjoyable to hear Jericho discuss their 2011 feud, which culminated in a tremendous Mania match at XXVIII. Hearing that the original plan called for Jericho to tattoo Punk in the ring was both insightful and disappointing, given that they ultimately went with the less-than-stellar family history of alcohol abuse. Ugh. Don't even remind me of that stupid storyline. Jericho can certainly get a bit full of himself at times -- In fact, most of the beginning concerns a Middle East tour that he makes out to be some kind of war movie -- but he still makes for an entertaining narrator. Even if it means having to how brave and badass the WWE crew was for getting booked in one of the most dangerous places in the Middle East during war time. We get it. Now tell us what rib Malenko pulled while on the tour. I think that my main problem with the music sections is that most of it comes off as braggy. He's constantly name dropping, even when it doesn't really feel relevant to the story. It's hard to tell whether he's doing this intentionally or if this is really just how his life works and he's oblivious to how he sounds repeating it but it definitely makes for less grounded writing. I'd be lying if I said I wasn't a little disappointed but that's mainly due to my own expectations. I'm a wrestling fan so I wanted wrestling insight and awesome stories and while that does exist within this book, it's not the meat and bones of the content. Regardless, I'm still really looking forward to whenever Jericho does his fourth book. I just hope that it can be as insightful as the first while still providing that unique Jericho charm.